When J. P. Morgan called a meeting of New York's financial leaders after the stock market crash of 1907, Hetty Green was the only woman in the room. The Guinness Book of World Records memorialized her as the World's Greatest Miser, and, indeed, this unlikely robber baron -- who parlayed a comfortable inheritance into a fortune that was worth about 1.6 billion in today's dollars -- was frugal to a fault. But in an age when women weren't even allowed to vote, never mind concern themselves with interest rates, she lived by her own rules. 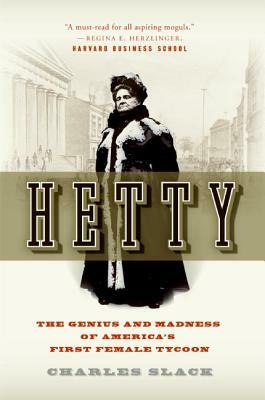 In Hetty, Charles Slack reexamines her life and legacy, giving us, at long last, a splendidly "nuanced portrait" (Newsweek) of one of the greatest -- and most eccentric -- financiers in American history. Charles Slack is the author of Noble Obsession: Charles Goodyear, Thomas Hancock, and the Race to Unlock the Greatest Industrial Secret of the Nineteenth Century, named one of the New York Public Library's twenty-five "Books to Remember" for 2002, and Blue Fairways: Three Months, Sixty Courses, No Mulligans. His writing has appeared in many national magazines. He lives in Connecticut with his wife, Barbara, and their daughters, Natalie and Caroline.